Brussel sprouts always get a bad rap. And unfortunately, it starts in a pot of boiling water way back in childhood. And honestly, eating bland boiled cabbage is enough to scar every child all the way through adulthood. So what makes them any different now and why should you give them a second chance? Because, the truth about all vegetables is that they taste as great as their cooking methods and seasonings. Don’t blame the vegetable. Blame your mom. Or whoever boiled them in the first place. So here is how you make something that triggers childhood food trauma into an epicurean delight. 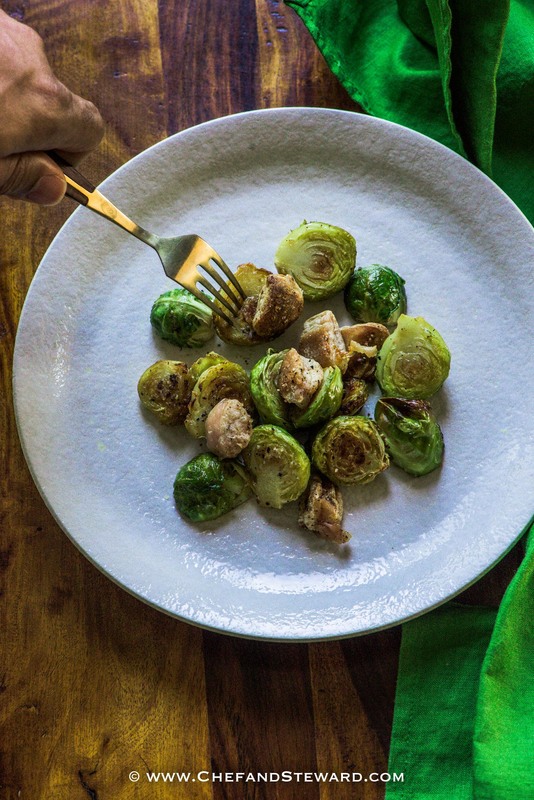 This is the making of Roasted Brussel Sprouts with Sausage and Bacon- a dish that will become a new family heirloom recipe and a staple on your Thanskgiving and Christmas dining tables. 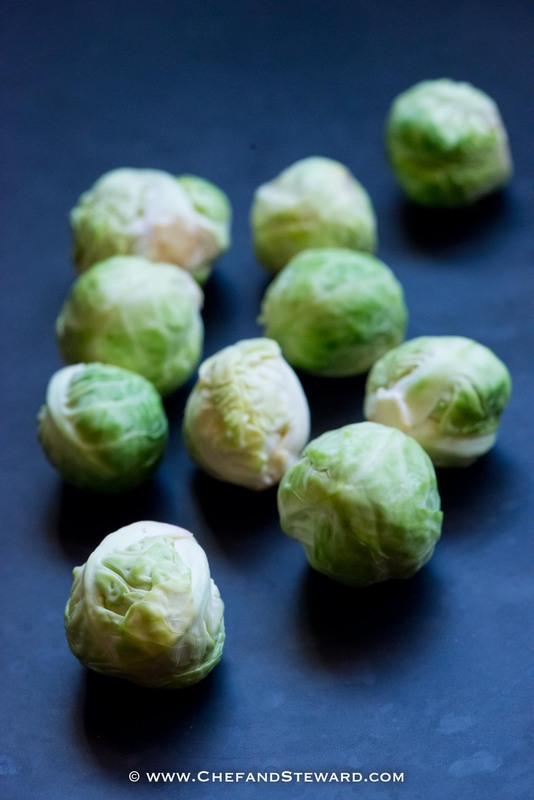 Firstly, lets appreciate just how beautiful and intricate they are… in a bid to reframe our mind’s perception of Brussels sprouts. We never had these growing up in Jamaica but needless to say, I was overcome by their cuteness when I moved from my home country in my 20s. Instinctively, I explored all the foods I didn’t have growing up and Brussels sprouts was one of them. Over the years, I have tried several ways to cook them, and they are a really tough vegetable to get right. But they are a great winter vegetable and when done right, are absolutely delectable. For me the two major secrets to great Brussel sprouts are fat and salt. Use good quality of both and add generously. This recipe uses both extra virgin olive oil and either bacon or bacon fat. Flavour is what we are all about. This recipe could be a keto, low carb, paleo meal all on its own or could be used as a side dish on a festive table or for a nice side to a Sunday roast. That would utilize the oven efficiently as you could pop this in while your roast is going. Cut sprouts in half lengthwise. 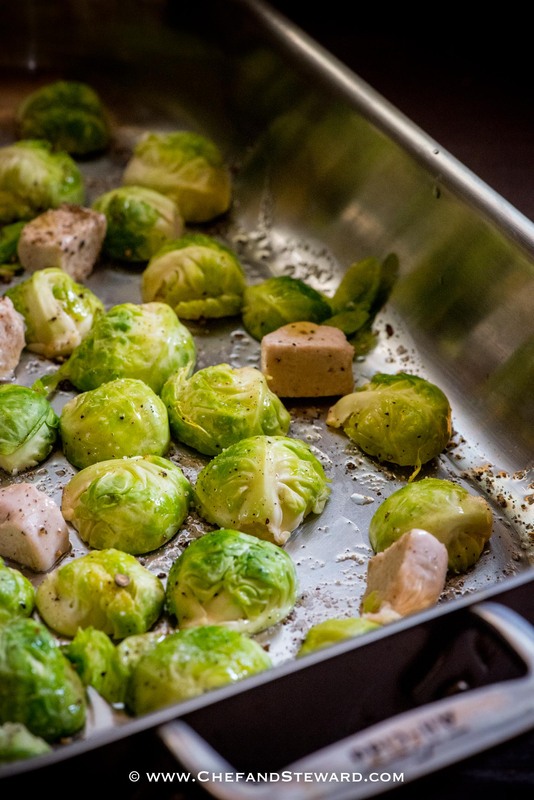 Place the Brussels sprouts in a baking pan, including some of the loose leaves, which get crispy when they're roasted. Add sausage, bacon fat, olive oil, 1 1/2 teaspoons salt, and 1/2 teaspoon pepper, toss with your hands, and spread out in a single layer. 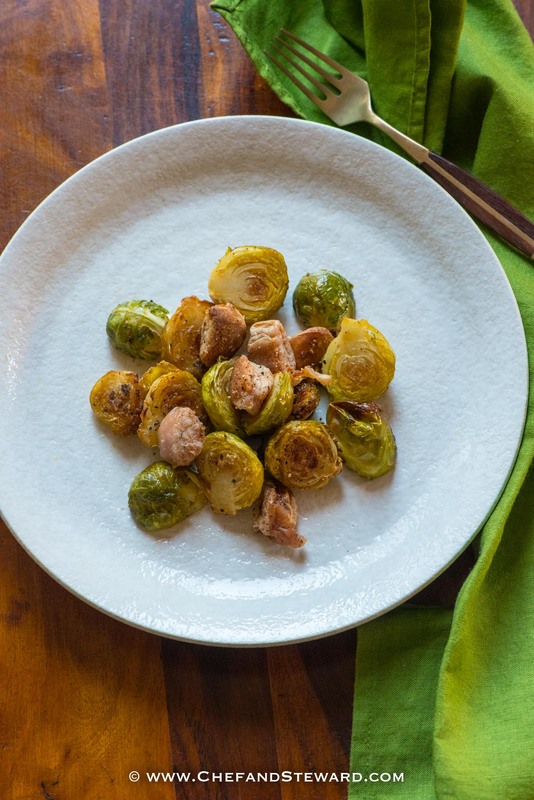 Roast the Brussels sprouts for 20 to 30 minutes, until tender and nicely browned and the sausage is cooked. Toss once during roasting. Taste for seasonings, and serve hot. Looking for other holdiday side dishes and drink recipes? Mmmm, I love roasted Brussels sprouts! It’s almost time to harvest them here in NH too… I can’t wait to try them this way, although I’ll be substituting with some vegetarian sausages. Thanks for sharing your method! Wow do you grow them? It’s so great that you get to have them so fresh. We are expats in countries that have to import the majority of foods. As you wish and substitute your vegetarian bacon as well or use 4 tablespoons/ or 1/4 cup of extra virgin olive oil. Love it. I’m on a huge brussel sprout kick right now. I make a big batch of roasted ones every week. So good. I’ve never added sage, I’ll have to try that! I didn’t add sage- it was sausage. I think it may be a typo. It’s definitely the time for them! Interesting that you make them every week. Do you reheat during the week? We love brussels sprouts at our house too. I have never tried them with sausage but it looks amazing. Thanks for the recipe. Thanks for your comment Jere. You could substitute with cabbage as well. Even cauliflower. You are so right! 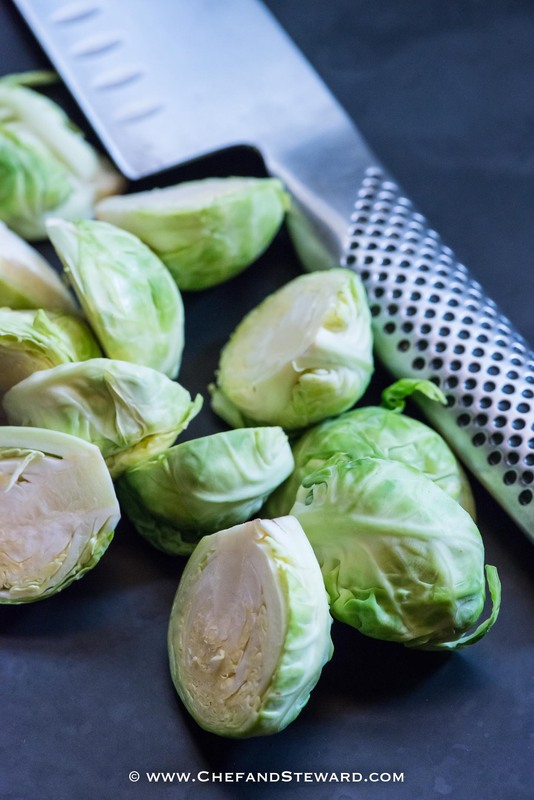 Brussel sprouts do have a bad reputation and it does begin in childhood with boiled brussel sprouts. This happened to me, until last year when I found that there are so many things we can do to make it more interesting. And this looks so amazing! Stine, I am so happy that you have given yourself the opportunity to reimagine the drudgery of boiled Brussels sprouts. It’s Thanksgiving weekend this coming weekend in Canada. 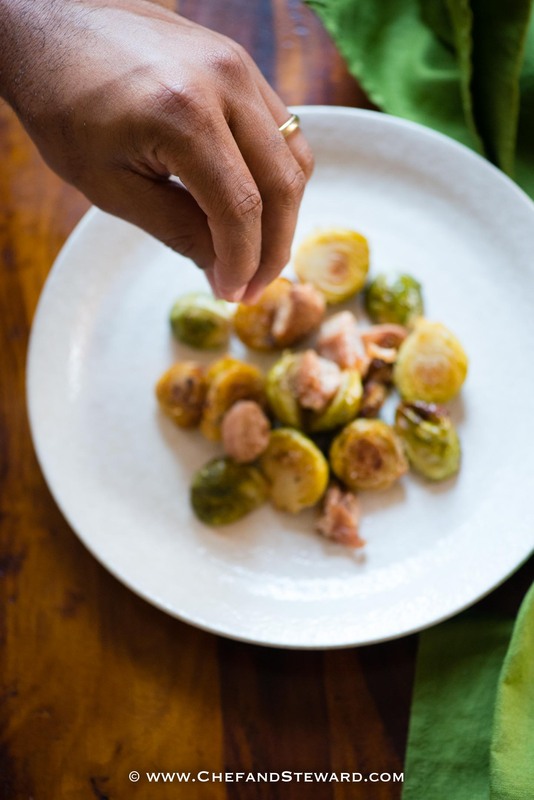 Brussels sprouts are ALWAYS on the menu. This looks like a great recipe to try. Happy Canadian thanksgiving when it come! Hope you like it. I only recently started eating brussel sprouts so now I will have to try this, thanks! Happy to add to your recipes for a newly discovered vegetable! So exciting to hear that you are adding new things to your diet. 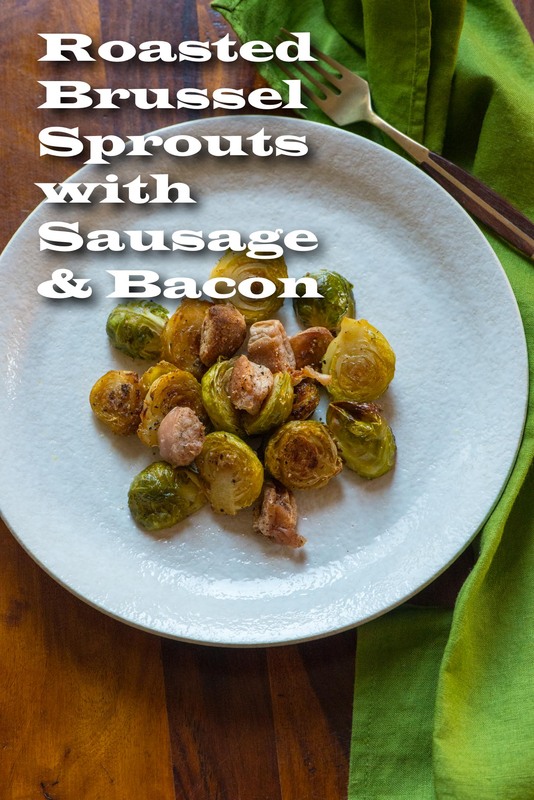 Roasting is my favorite way to prepare sprouts but adding sausage and bacon? That sounds incredible! I can’t wait to try this. Amanda, the additional flavour that the sausage and bacon give really takes it up a notch! 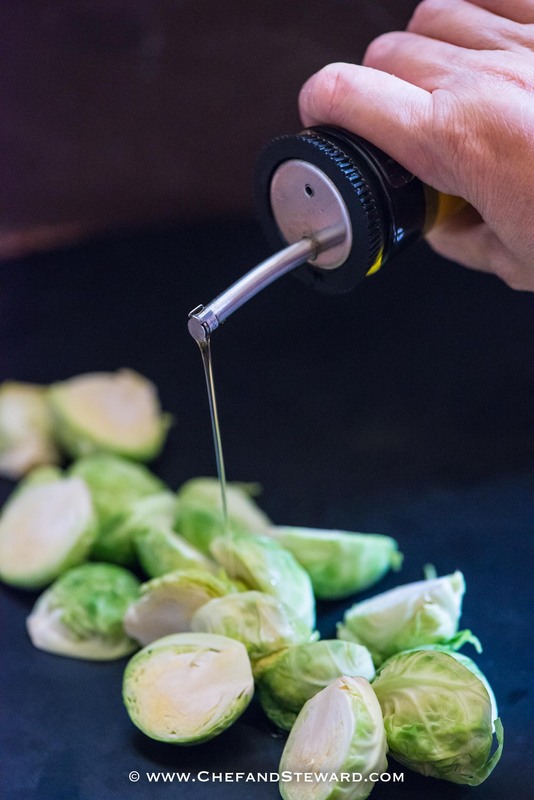 This is my favorite way to cook brussels sprouts. The roasting brings such a nice flavor and it is so easy to prepare. Perfect side dish for any main dish. Adriana, yes, roasting is one of my favourite cooking techniques, period for the very same reasons. Absolutely! No frills, no fuss, no drama no carbs! It’s amazing just how our tastes can change once we give ourselves permission to be challenged Karyl. Yes the bacon is a classic and the pork sausage just amplifies it. 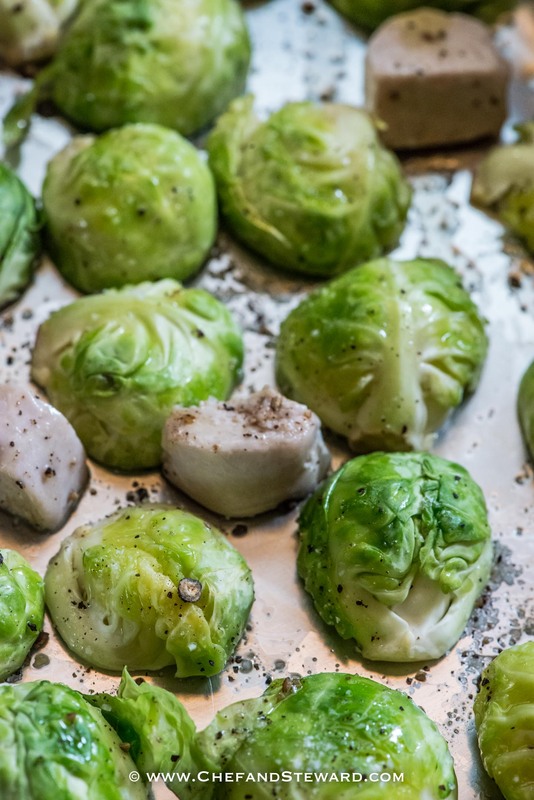 I’ve always loved brussel sprouts even boiled, but roasting them certainly makes them tastier and roasting them with sausage and bacon sounds scrumptious! You are very special for loving boiled brussels sprouts Jacqueline. But yes, should you ever want to amplify the flavour, this recipe is for you! Brussel sprouts are always the best. Too bad I do not have them enough. I have never had them with sausage. A must try! Thanks for sharing. The bacon and sausage together just totally transform them! It is! Happy Thanksgiving when it comes.